We’re working hard to create an environment where shopping is fun… a place where our customers can discover new treasures every week… a store where entire families can enjoy hunting for that special something. We bring it all to you in stores that are bright and well lit, clean and well organized… and stocked with the items you’re looking for! Just as important, especially during these tough economic times, we continue to offer our customers the products they need at extreme values! We’re expanding our assortment of merchandise, constantly bringing you new and exciting items. 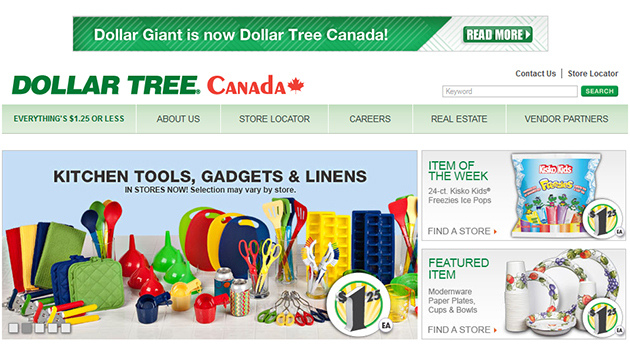 Some of the product departments you’ll find at a Dollar Tree store in Canada include housewares, glassware, dinnerware, cleaning supplies, candy, snacks, food, health and beauty, toys, gifts, gift bags and wrap, party supplies, stationery, craft supplies, teaching supplies, books, seasonal décor, and more! We carry everything you need for every day, every holiday, and every occasion… and every single item is affordably priced at $1.25 (or less).